Media Player Classic Home Cinema (MPC-HC) is an extremely light-weight, open source media player for Windows. It supports all common video and audio file formats available for playback. Comparing with other big name giants in the realm of free media players, such as VLC, Windows Media Player, MPC-HC succeeds in its resource-efficient and minimalist design. • Lightweight—Watch movies on any SSE CPU, even on your old computer back from '99. • Customizable—With its wide array of options, MPC-HC toolbars can be customized to fit almost any needs. • All around player—MPC-HC can also be used as DVB player. • Dozens of video formats supported—MPEG, MPG, MP2, VOB, ASX, ASF, WM, WMV, AVI, D2V, MP4, SWF, MOV, QT, FLV, MKV. Part 1: What are iTunes M4V videos, and why MPC-HC cannot play them? The M4V file format is a video container format developed by Apple and is very similar to the MP4 format. But M4V files may optionally be protected by DRM copy protection. 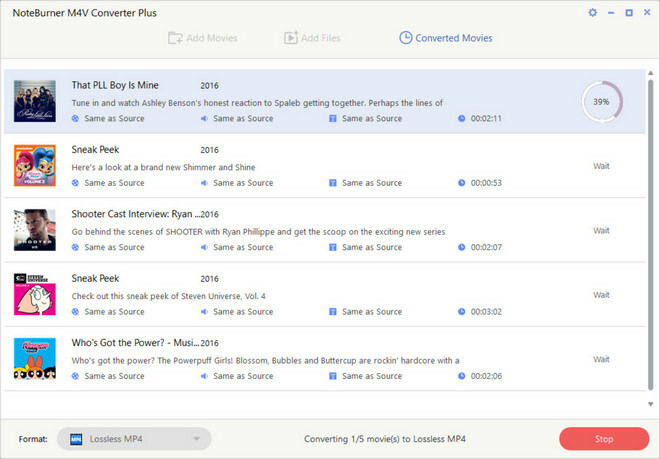 Apple uses M4V to encode video files, such as TV episodes, movies, and music videos, in its iTunes Store, which makes Media Player Classic Home Cinema fails to play iTunes M4V Videos. When it comes to this issue, removing DRM from iTunes M4V Videos is the best way to make it possible to play iTunes M4V videos on Media Player Classic Home Cinema. In this case, you need a powerful and professional DRM removal tool on Windows. NoteBurner M4V Converter Plus for Windows is second to none to help you fulfill this purpose. It adopts an innovative DRM decrypting technique which makes it possible to unlock iTunes DRM rented and purchased videos with lossless video and audio quality at 20X faster speed. Download NoteBurner M4V Converter Plus for Windows trial version to have a try. Part 2: How to play iTunes DRM M4V videos on Media Player Classic Home Cinema? 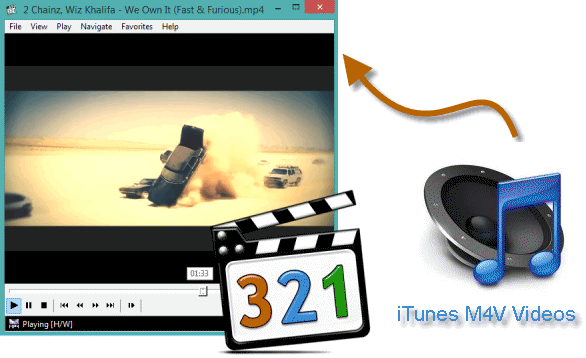 Import the M4V videos you have downloaded from iTunes Store to the NoteBurner. Click the "Add " button on the upper left and choose the video you need to convert in the pop up dialogue box. Or you can find the video file and directly drag and drop the video to NoteBurner to finish importing. 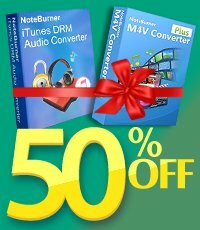 NoteBurner iTunes Video to MPC-HC Converter offers multiple output formats, even includes audio formats, such as MP3, AAC, and so on. Output format as "Lossless MP4" enables you convert iTunes videos with all subtitle and 5.1 audio track kept. 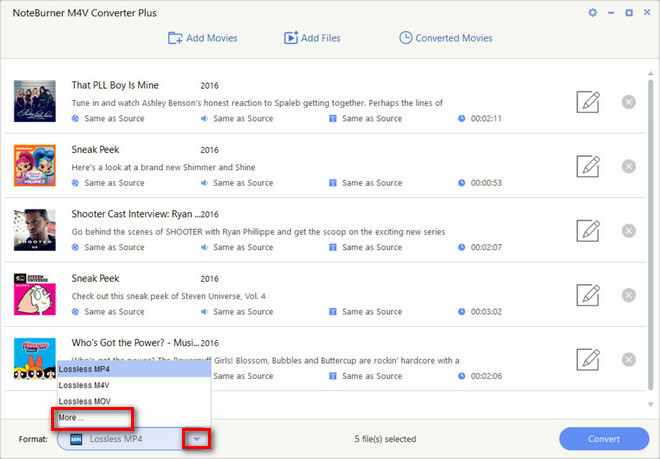 Now you can press the "Convert" button to start converting M4V iTunes movies to MP4 or other Common Video Formats. After it is done, you can play them with Media Player Classic Home Cinema or other video players smoothly!